When we’re working with new homeowners on determining the details of building their new deck or porch, homeowners often ask about the best time to build. Is it summer? Winter? Now? Next year? The unfortunate truth is that 5 years ago was the best time to build. Many homeowners don’t know about the tremendous inflation in the cost of building materials. 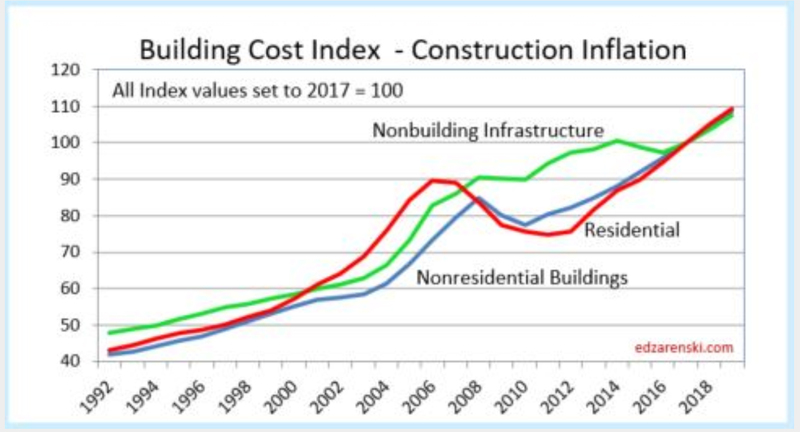 As you can see from the graph above, the cost of building materials increased steadily from 1992 until 2006 when it began a downward cost spiral until 2012. Even though there was much economic recovery after the recession, building material costs continued to stay low for a number of years. Over the last 6 years, building materials costs have done nothing but rise. While we can’t predict the future, this graph shows us that we should expect costs to continue to rise unless there is a national economic setback. Are all materials costs increasing? While you may not be surprised that the cost of framing lumber is increasing, you may be surprised to know about other material cost increases. Not only have the costs of large items increased such as the cost of railings but even the cost of nails and other small materials costs increased. Unfortunately, materials costs are not the only consistently increasing prices. Labor costs have increased as well as other necessary costs such as building permits and insurance have increased. While it’s frustrating to know that the outdoor project you’ve been dreaming of may be getting more and more expensive, now is a better time to contract your project than next winter or the following spring. 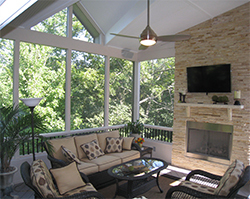 If you’ve been dreaming about your new porch, deck or outdoor fireplace; now is absolutely the best time to build. Give us a call now for a free design consultation at (913) 851-3325 or drop us an email. We look forward to helping you plan and build the outdoor space you’ve been hoping for.